Echipa AVmall incearca sa mentina acuratetea informatiilor din acesta prezentare. Cu toate acestea, in anumite cazuri, pot aparea mici inadvertente pentru a caror semnalare va suntem recunoscatori. Ne poti contacta oricand pentru a clarifica eventuale nelamuriri. Nu uita sa mentionezi in corespondenta ta numele exact al produsul. Fotografia produsului Boxe Active Yamaha TSX-B15D are caracter informativ si poate sa difere de produsul real sau sa contina accesorii neincluse in pachetul standard al produsului. Specificatiile tehnice pot contine erori de operare si pot fi schimbate fara instiintare prealabila de catre producator, neconstituind obligativitate contractuala. Featuring a unique shape, the TSX-B15D will enliven the mood of any room. Bluetooth®-compatible, the TSX-B15D makes music more accessible, letting you play anytime from all kinds of devices. With an array of useful lifestyle functions, the TSX-B15D will bring a little more color to your daily life. The TSX-B15D features a bold circular design motif. The moulded body is characterized by elegant curves that appear to change depending on the angle you are looking from. The round central control panel has been machined with concentric circles, then subjected to a high-intensity aluminum powder coat and finished to a beautiful gloss. With the appearance of a small interior objet, the TSX-B15D will light up your room. 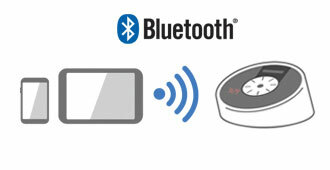 By connecting with Bluetooth, you can listen to music from a handheld tablet device or smartphone with ease. The TSX-B15D is fitted with two 5 cm full-range speakers and a bass reflex port to reproduce all the richness and width of the stereo source. The stylish clock displays a bright red LED that appears to float over the speaker grill. 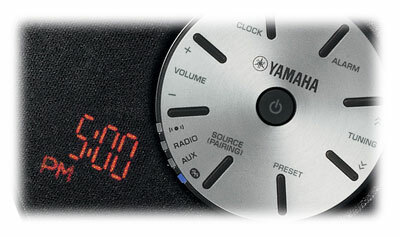 The clock also has an alarm function, so you can place the TSX-B15D at your bedside and use it to set your wakeup time. In addition, an integrated USB port allows you to recharge your smartphone or tablet while using it. Nu sunt recenzii pentru Boxe Active Yamaha TSX-B15D. Fii primul care scrie una!